With the proper running shoe, what is the key to running happy – How to Run Happy? The key to run happy is with the proper running shoe. The proper running shoe keeps your feet happy and when your feet our happy you are happy while running. It makes since because when you are running one of your 2 feet are always on the ground pounding against the ground every step, so yes the key…A proper running shoe…So you can run happy. If your feet are hurting it will not be a pleasant run because that is all you willing be thinking about. Always remember running is for everyone and running doesn’t just has to be for exercise but can done with passion for the sport. So why wait anymore? 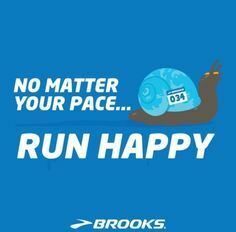 Get up and buy a pair of Brooks shoes, so you can finally Run Happy! Next Post Mens Brooks Adrenaline GTS 17s!! !